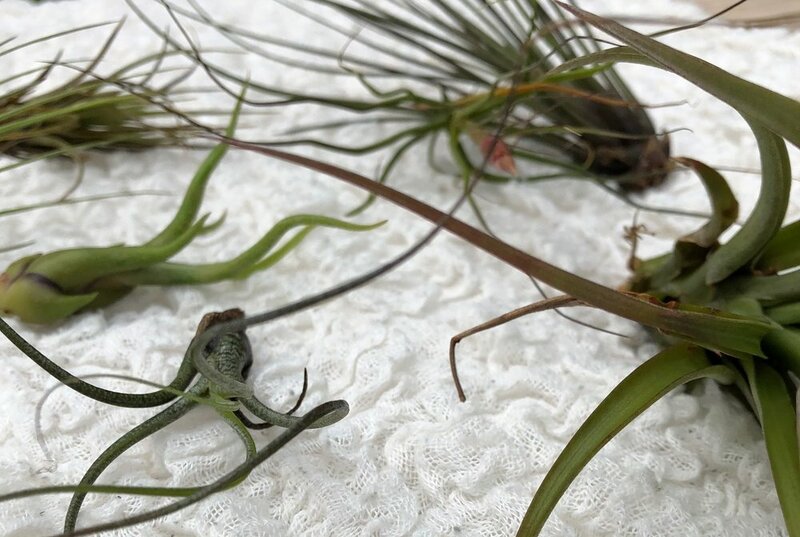 Simple Air Plant Care, Even If You Don't Have A Green Thumb — The Restored Board Design Co.
Air plants (Tillandsia) are supposed to be some of the most low maintenance plants, trust me, I know from personal experience, that it is possible to kill them. Shane is really the one with the green thumb in our house! Thank goodness for him or our flowers and vegetable garden wouldn't have a chance with me! To make your purchase as easy as possible, follow these simple steps to ensure that your air plant stays adorable, and most importantly alive, in your new air plant holder. Your Tillandsia needs light, like any other plant, but do not make the mistake of putting it in directly in the sun as it can burn your air plant. Bright indirect sunlight within 3 feet of a window is best. Optimum temperature range for air plants is 60 - 90 degrees Fahrenheit, so indoors is best where the temperature is more controlled. One to two times a week (depending on how dry your climate is), completely drench your air plant in tap water for approximately an hour. After removing from the water, place on a dry paper towel to let completely dry before placing back into your air plant holder. If you notice your plant becoming dry in between waterings, feel free to spritz it with water. Occasionally an overnight soaking may do the trick if your plant has become very dry. While not absolutely necessary, fertilizer can result in faster growth of your plants. You can find this from various websites by searching for "Air Plant Fertilizer". If you choose to go this route, lightly spray plants once per month. That's all guys, not too hard, right? No more complicated that a normal plant. Let us know if you have any questions. Good luck with your new plants!